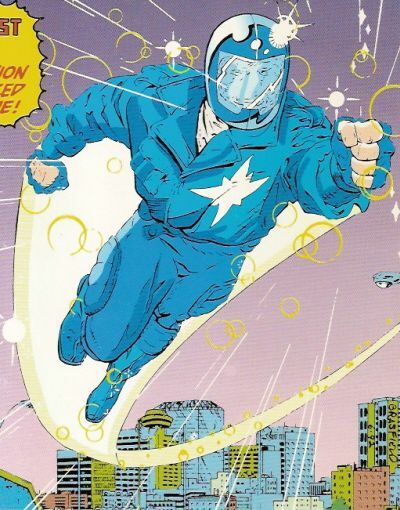 Enemies: Professor Baldwin, Brock, Channel Master (Ed Kelly), Gunthar, "Hobbes," Lund, Mr. Small, Nightfire, Ren, Stephie, "Two-Headed Dog-Man"
Powers/Abilities: Illuminator's powers include the ability of flight and the discharge of a light-based energy. He can create an "afterglow," an image in his likeness created from the light he was imbued with. 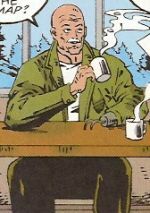 He would glow more brightly as he used more power, and had some level of super-strength, though this and several of his other abilities seemed to ebb and flow with how much he really needed them in a situation. (Illuminator#1) - Andy attended Camp Cades Cove during the summer, where he did not impress his camping group with his softball skills, in particular Lund. Lund and some of the other boys decided to pull a prank on Andy by sending him on a hunt for a non-existent creature called a Wampus in the middle of the night. While in the forest, Andy came across a bright light hovering above him, which showered him in its glow. It imbued him with powers that gave him flight and caused him to shine brightly. Scared, he made his way back to the camp, but when he realized that he'd been duped by the others, decided to use his new abilities to scare them. He pretended to be an alien and chased them all the way to the adjoining girls' camp, but one of the boys, Cap, went astray and found himself stuck on the side of a cliff. The glowing Andy saved the boy then returned to the camp, where he claimed ignorance of the nights' incident. When he returned to school, Andy and his friend Herb were conronted by local drug dealer Nick Malloy and his cohorts Ren and Stephie. Andy refused to deal with them and walked off, though he considered using his powers to teach Nick a lesson. Shortly thereafter, Nick killed a demon-possessed man and stole the amulet the man had around his neck. Andy and Herb were invited to a party, where they got drunk. When Andy ran out back to vomit, he found Nick, who was at the party as well, draining the lifeforce from another person. When the decaying Nick attacked, Andy used his powers to fly away. The next day, Nick tracked Andy to his house and threatened his brother Skip, but Andy fought back, but was outmatched. As Andy tried to escape, he was pulled to safety inside a church by Gus. The old man convinced Andy that God was protecting him. 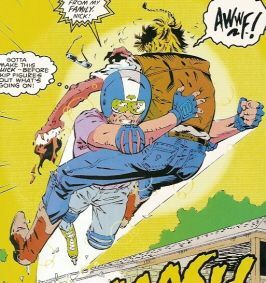 Strengthened by his new resolve, Andy used Gus's old biker jacket and helmet, and flew off as the Illuminator to confront Nick, who was creating havoc at a local mall with the horde of undead he had created. Nick revealed his true new form, that of the demon Nightfire and attempted to steal Illuminator's powers, but Andy realized he had to overload the creature with them. This caused Nightfire to blow up, returning all of his undead victims back to life. Afterwards, Andy and Gus discussed the situation, and Gus was convinced Andy was given the powers to fight evil in the name of Jesus. (Illuminator#2/1) - As the Illuminator flew over Davidson University, he heard screams and investigated. On campus, he found a tiger-man attacking students and drove it off. He then tracked down his older sister Diane on campus, and toured the grounds with her. Feigning an interest in bioengineering, he was taken by her to meet Professor Baldwin, who he thought might be connected not only to the tiger-man, but to reports of homeless people disappearing from the streets of Nashville. Baldwin showed him around for a while, but became angry when Andy questioned his work's role in the will of God, and Baldwin threw him out. Shortly afterwards, Illuminator witnessed an alligator-man attacking football players in the school's stadium. He tried to use his powers to separate the man from the animal, but when he did, a woman recognized the man as Brock, her boyfriend, and knocked Illuminator unconscious to keep him from killing the creature. When he woke up, the girlfriend explained the situation, and told Illuminator that Baldwin was behind the experiments. He returned to Baldwin's lab, and was attacked by the scientist's creatures. After accidentally killing one, Illuminator could only watch as the others realized the monstrositites they'd become, and they tore down a construction site atop themselves and Baldwin. (Illuminator#2/2) - During the Christmas season, Andrew attempted to locate his father's wartime buddy Dale Johnson, which took him to the town of Henderson. There, he learned Johnson had been involved in drug trafficking. He went to the local authorities to investigate, but when the deputy wouldn't cooperate, Andrew donned his Illuminator outfit and claimed to be the Ghost of Christmas Yet to Come, demanding the policeman tell him about Johnson. He tracked down Johnson and found him in the middle of a drug deal. Illuminator defeated the criminals, during which Johnson revealed he was an undercover agent for the Drug Enforcement Agency and that his "drug past" was a ruse to lure in unsuspecting drug traffickers. After the criminals were arrested, Andy returned home to his worried family, and presented Dale to his father as his Christmas present. (Illuminator#3/1) - After his friend Traci Austin disappeared (having been seduced into a cult after her ordeal with Nightfire), Andy began searching for her. He serached various occult boutiques, and learned that a man named Ed Kelly was a well-known occultist known for his use of crystals (Traci's father had mentioned she was involved in a "crystal cult"). Andy sought Kelly, who was known professionally as the Channel Master. 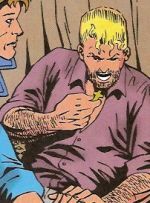 He tried to scare Kelly into revealing the whereabouts of Traci, but the Channel Master invoked a demon named Gunthar, who attacked the Illuminator. To defeat Gunthar, Illuminator charged one of the demon's mystic crystals with his own energies and threw it into the monster, sending it back to its own dimension. Channel Master ordered several of his cultists (including Traci, now rechristianed Chakra) to attack Illuminator, showing him the different fantasy worlds they could imagine with the crystals. Illuminator used his powers to show Traci a recreation of Paradise, and regaining her sanity, she aided him in defeating Channel Master. Illuminator returned Traci to her home, and was heartbroken the next day when he went by to check on her only to find her back with her brutish boyfriend Artie. Elsewhere, Channel Master reported his failure to a being named Mr. Small, who, upset over the incident, trapped Kelly within a crystal and shattered it before vowing to defeat the Illuminator. (Illuminator#3/2) - Traci, tired of how her life had gone, visited Gus and Andy, asking for their help in finding God. 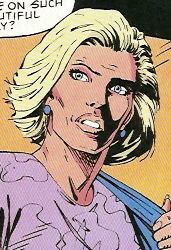 (Illuminator#3/3) - Andy's mother spent the better part of a day worrying about him and how he showed no responsibility, all the while he was saving children and defeating criminals as Illuminator. He barely managed to sneak back into the house after dark before she caught him. Comments: Created by Glenn Herdling, Craig Brasfield and Frank Turner. Illuminator was a series published by Marvel in conjunction with Nelson, a company devoted to Christian books. However, as per the indicia, all the characters, including Illuminator, were fully created and owned by Marvel. Issue #4 was solicited, but apparently was never published, as no one seems to have seen a copy, and it is not on comics.org or any site that sells back issues. Illuminator#1 had a reference to the X-Men's "deaths" in Texas, which places Illuminator firmly on Earth-616. In case anyone was wondering. A girl from Andy's school, Andy attended a party at her house, where he confronted Nightfire before having to escape. Nightfire possessed Traci and used her to find Illuminator. After she was freed from the demon's control, she quit her job at her father's pharmacy and joined Channel Master's crystal cult. After Illuminator saved her from the cult, she turned to Andy and Gus for spiritual guidance. The Prentiss family's pet dog. 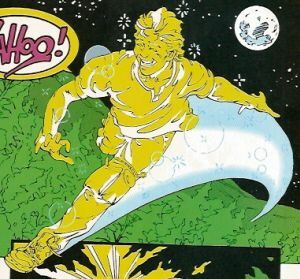 After he ran off, Illuminator's search for him led the hero to Professor Baldwin's genetic experiments. However, Bentley was not involved, and soon returned home to his loving family. Gus lost one of his hands as a younger man in a motorcycle accident, and it was replaced by a metal attachment. He came to live in one of the local churches, though his role there was unknown. He saved Andy from Nightfire and convinced the boy to look to Jesus for guidance. Over time, he became a mentor to Illuminator. A fellow soldier with Jay Prentiss in a war in Asia, Dale saved Jay's life. Years later, Jay's son Andy sought out Dale, hoping to bring the two old friends back together. In the meantime, Johnson had become a DEA officer and had gone undercover as a drug smuggler. Unaware of this, Illuminator broke up a sting operation, but ultimately helped Dale round up the real criminals before inviting Dale home to reunite with his father. A fellow camper at Camp Cades Cove, Lund played a prank on the new camper Andy by having him go into the nearby forest at night in search for a creature called a Wampus. Andy's sister, who attended Davidson University. Andy's father, a businessman who often traveled away from his family for long stints at a time. Andy's mother, who worried that he was irresponsible.